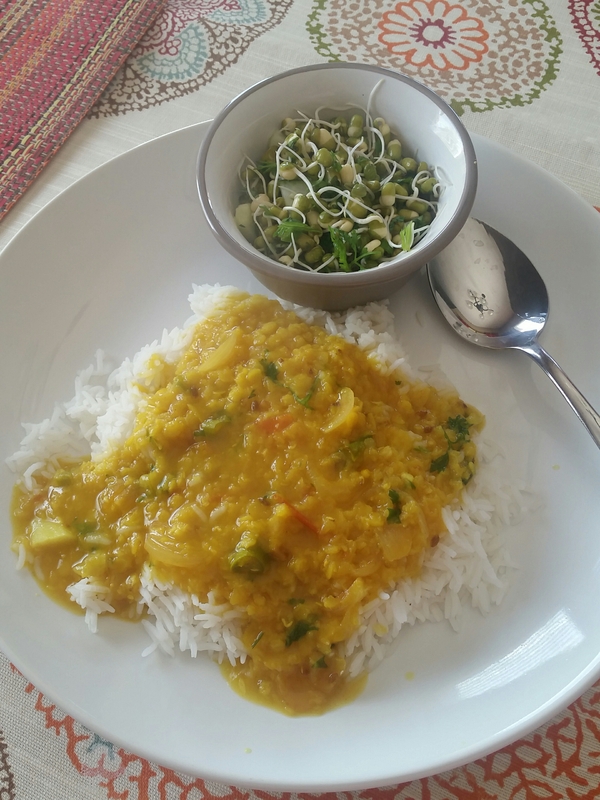 A simple Dal chaawal aka Rice and Lentil curry lunch or dinner is comfort food to the Indian soul. This simple Masoor Dal Tadka (Seasoned Dal made out of Orange Lentils) is by far the tastiest dal I make. 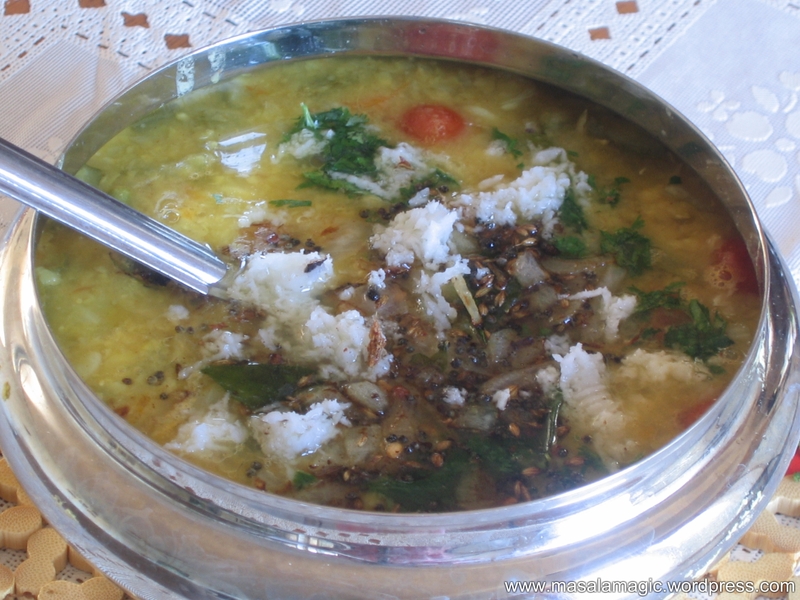 We love this dal at home!! 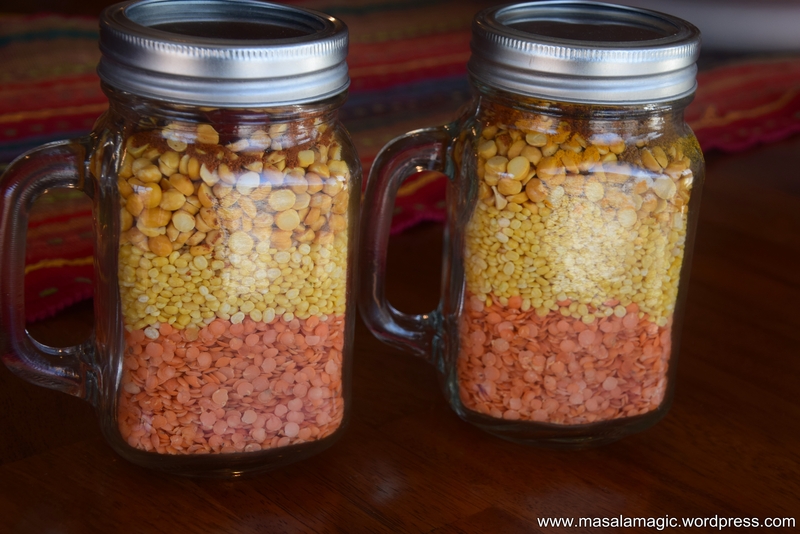 Masoor Dal or Masur Lentils is a tiny orange lentil that is actually called “Poor man’s Dal” since it is the cheapest of the dals. 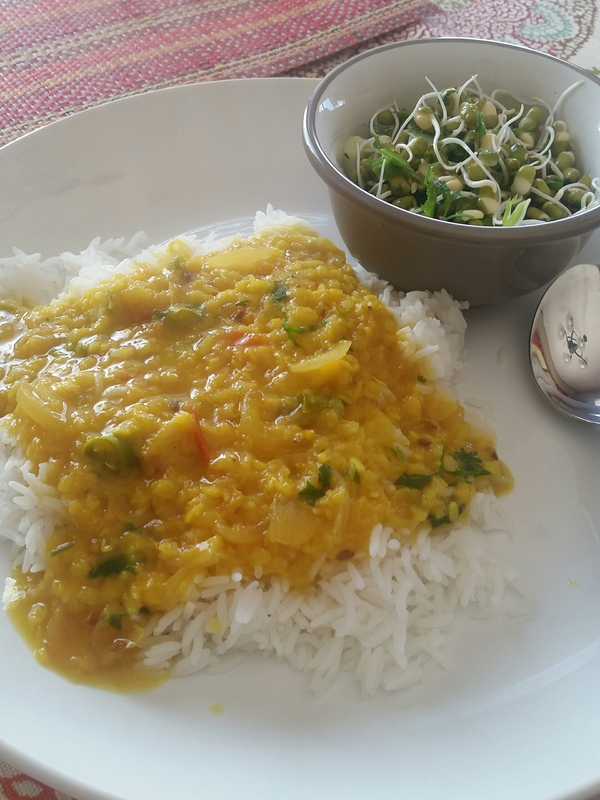 More popular in the north than the south, I make this dal at least once a week since it is simple, quick to put together and the kids will eat it without complaints. 1. Wash and soak the dal for 10 minutes. This makes the dal cook more evenly. 2. Then place the dal in a pressure pan, add the peeled garlic, 1/2 of the chopped green chillies, turmeric powder and about 3 cups water and pressure cook for just about 1 whistle. 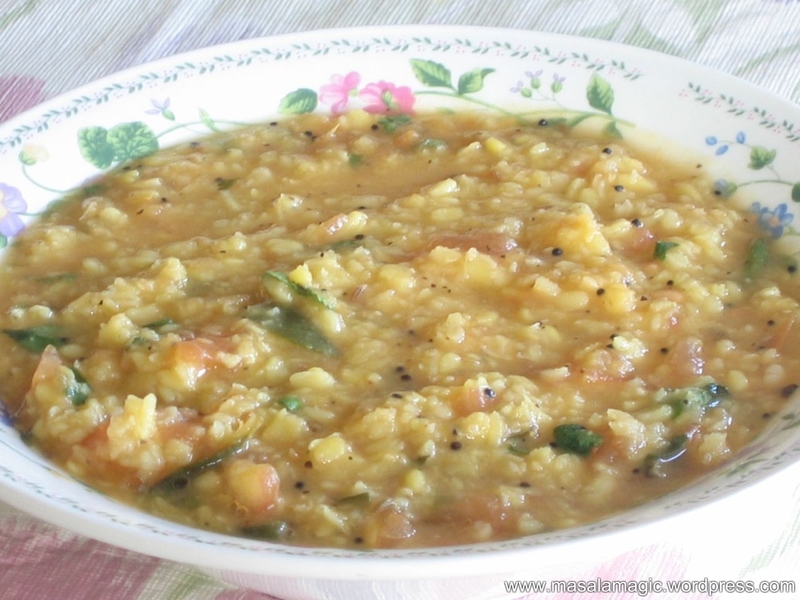 This dal cooks fast and it is tasty when the grains are somewhat separate. I usually cook just about 1 whistle and turn off the stove before the 1st whistle. This cooks the dal perfectly. Cool the pressure pan/cooker. 3. Chop the onions, tomato etc. 4. Heat the ghee (or oil) in a small pan. When it is hot season with cumin and hing. 5. 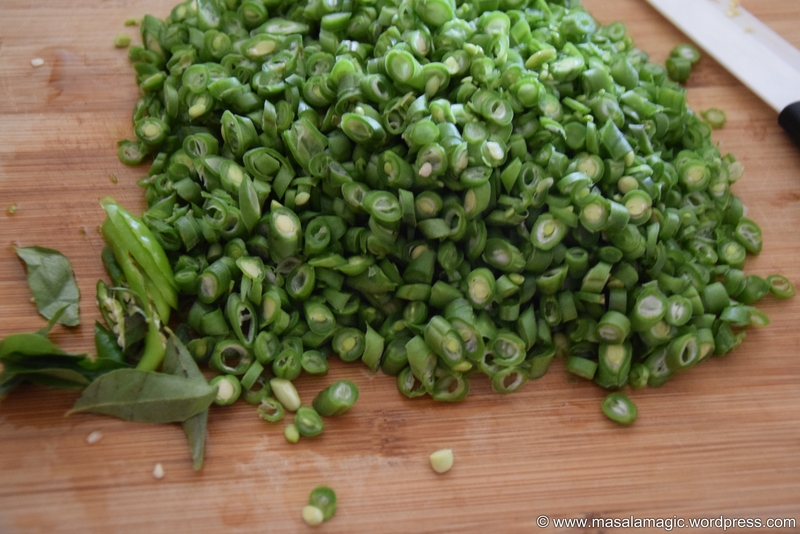 Add the chopped onions and the remaining green chillies. Fry for 2 minutes. Then add the chopped tomatoes. Add a pinch of salt and turmeric powder. Saute until mushy. 6. 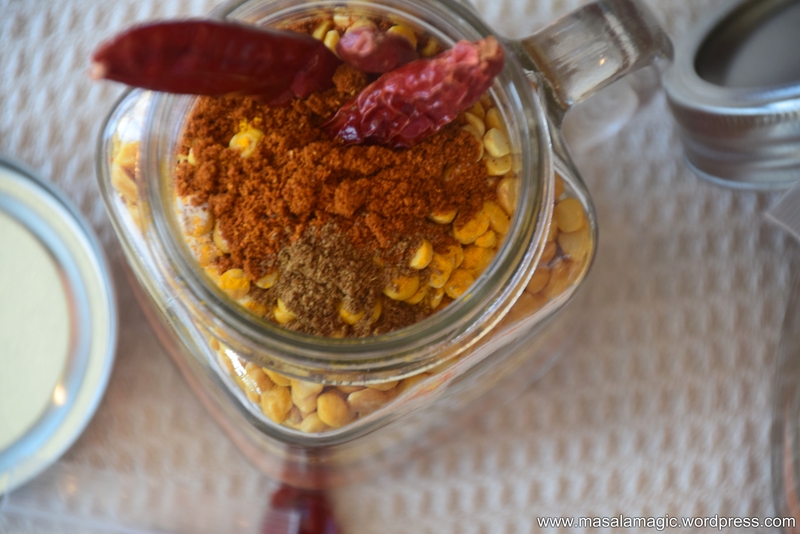 Add the curry powder and add this seasoning to the cooked dal. 7. Add salt to the dal and 1/2 cup of water if needed. 8. 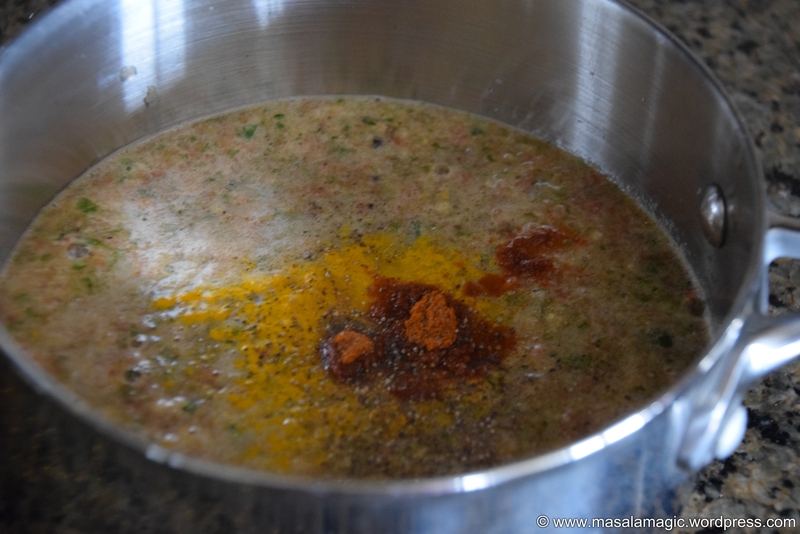 Boil this dal for about 5 minutes until well blended. 9. 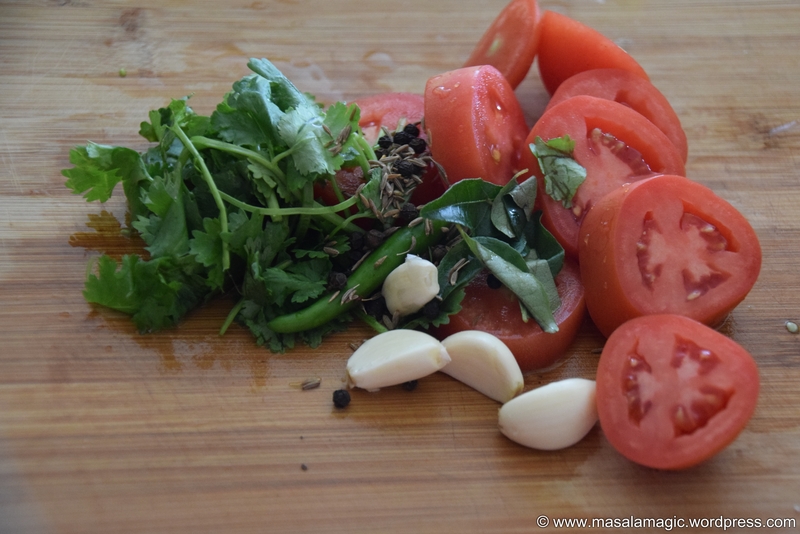 Garnish with chopped cilantro and serve hot with rice and ghee. Soak the Whole Moong overnight, drain and keep covered in a sprouter or tie the soaked whole moong in a muslin cloth or kitchen towel and place in a warm place. The sprouts should be ready in about 8 hours. These can be stored in the refrigerator for up to an week. Combine all of the above, mix well and serve cold. This curry is one such innovation in my kitchen. 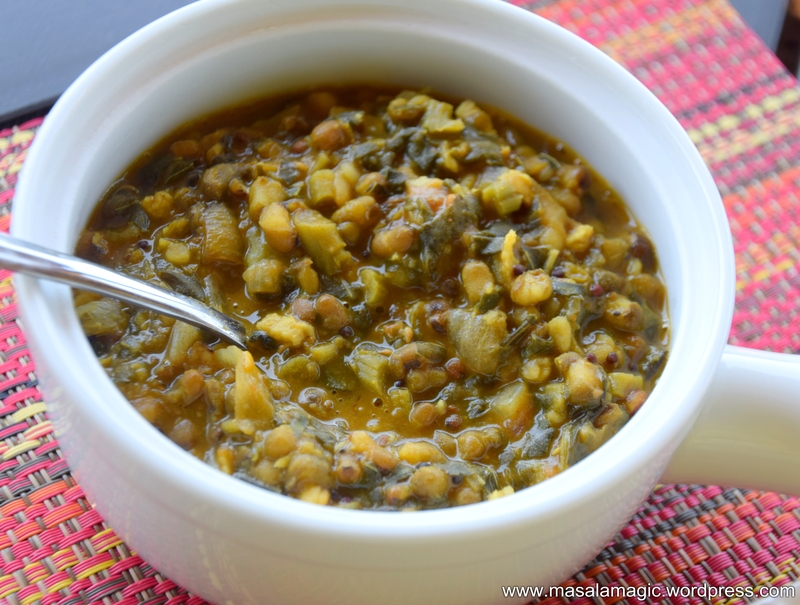 It is an interesting blend of whole moong or whole mung beans, spinach and spices. I typically use Chinese Spinach also Amaranth Greens or “Thotakura” / “Dantina Soppu” / “Tandulto” / “Thandu Keerai”. But you can also use regular spinach/palak and this curry will taste just as good. 2. Meanwhile chop all veggies and keep aside. 3. In a pan, heat oil. 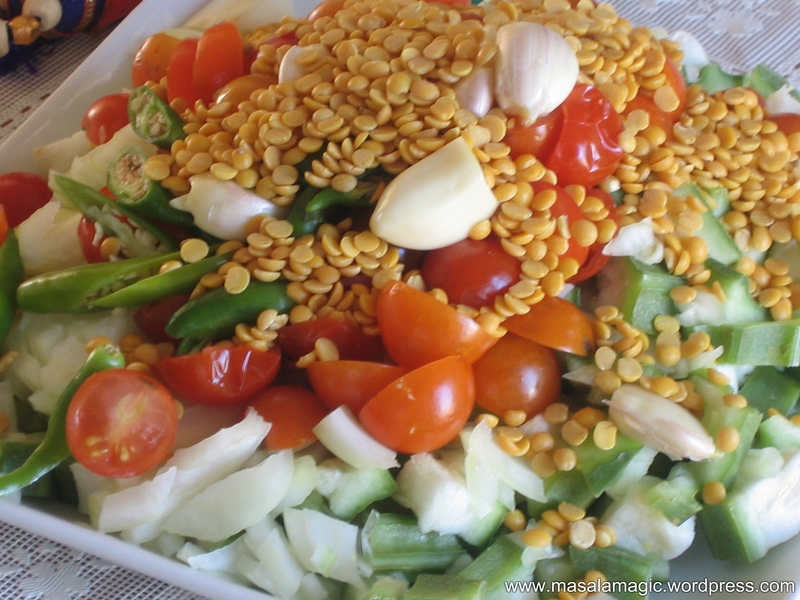 Add mustard seeds, cumin seeds and hing/asafoetida. Allow to splutter. 4. Add the chopped onions, green chillies and grated ginger-garlic and saute until the onions are golden brown. 5. 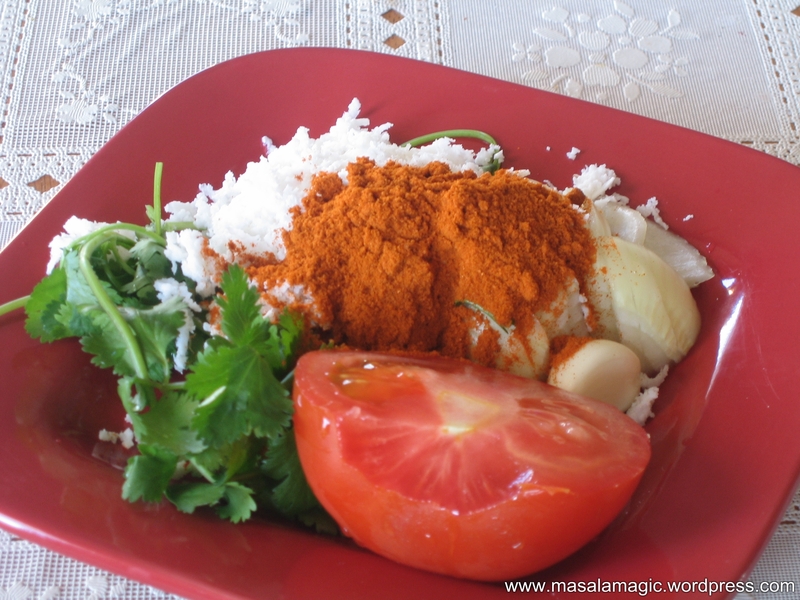 Add chopped tomatoes, turmeric powder and a pinch of salt and saute well until tomatoes are mushy. 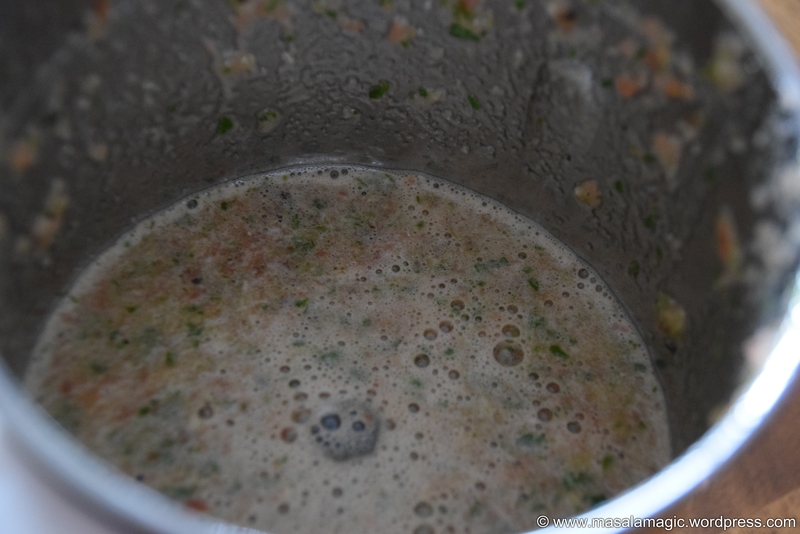 6.To this add the chopped spinach, curry powder or sambar powder and saute. Then add about 1 cup water and cook covered until the spinach is cooked for about 8 to 10 minutes. 7. 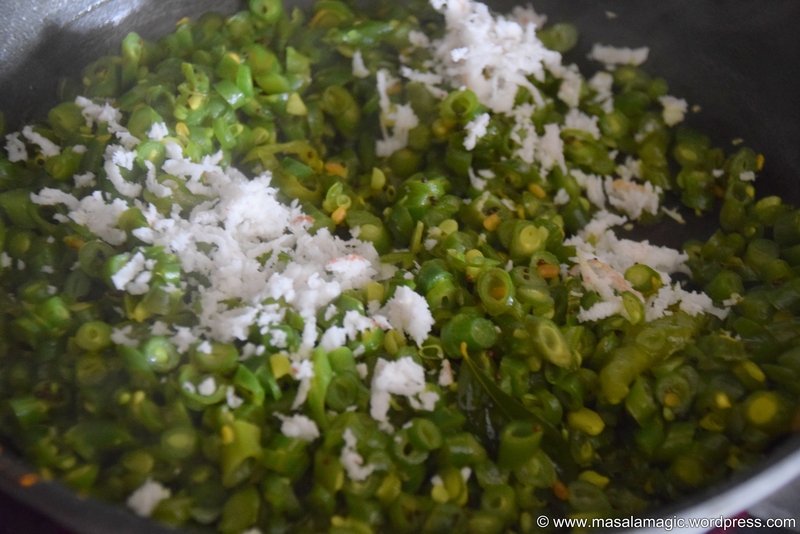 Then add the cooked whole green moong. Add any moong water also. Do not discard. 8. Add salt if needed and allow to cook for 5 to 10 minutes until the curry comes together. 9. Add grated coconut and mix well. 10. Serve hot with Rotis. I am so excited about this post..last week I found M Khan of unkhanny.com – a lovely blog with wonderful recipes, some great myths debunked straight from the Dr.’s mouth, lovely beauty facts and tips and some awesome DIY ideas!! I so fell in love with this DIY idea of hers that I had to try it right away!!! 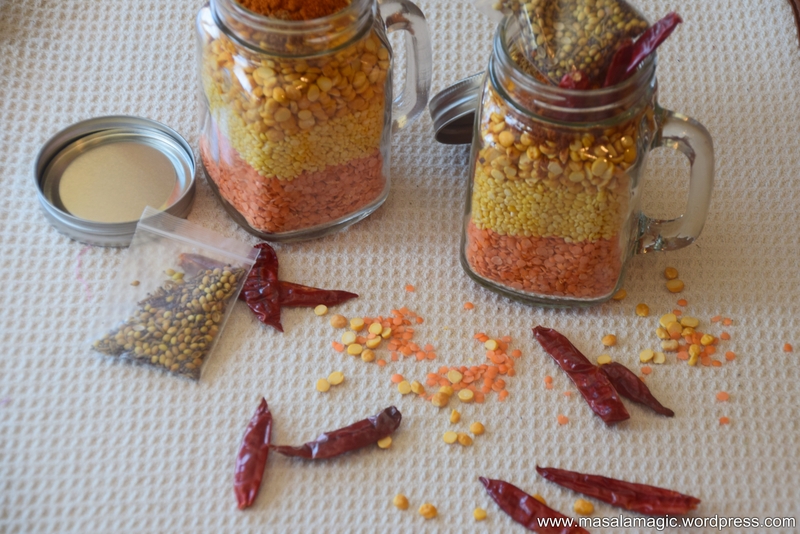 I stopped by the store yesterday to pick up some Mason jars and had a fun time putting together this great Dal To Go Gift idea 🙂 I did improvise a bit with the dal recipe itself from M Khan’s recipe… I added in the jar my signature home made Chilli masala powder, some home made cumin powder, amchur and turmeric powder. I toasted the seasoning ingredients as she has suggested and love that all one has to now do it to add the ingredients of the jar in a pressure cooker, add some salt and ghee for good measure 🙂 and cook until soft and of course serve hot!! Thank you M Khan for this great idea!! 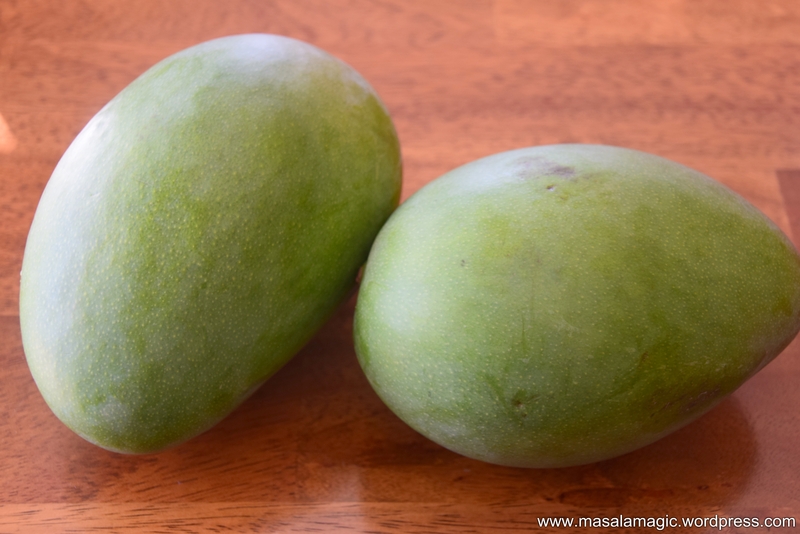 To continue the Dal Saga I am going to share with you today a Dal recipe from my kitchen..it is a South Indian Dal recipe, more specifically an Andhra dal recipe called “Mamidikaya Pappu” or “Mango Dal”..With the onset of summer raw mangoes in all forms and sizes are now available in the market in India.. 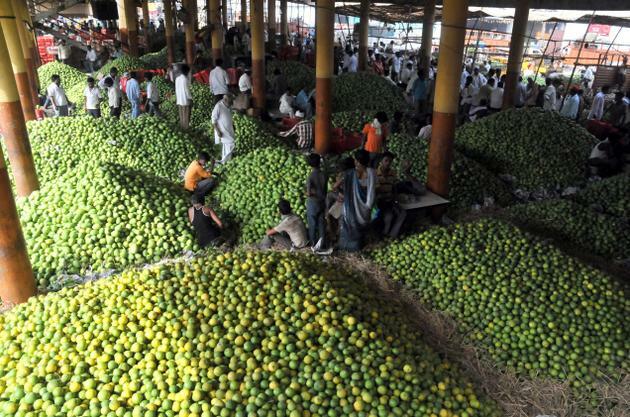 I miss the vibrant markets of India, the abundance of vegetables and fruits and the hot summers.. But I am not one to fret over it 🙂 I do enjoy my local groceries and whole foods market here in the US. 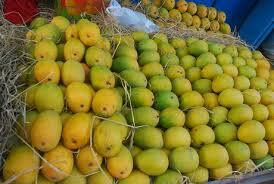 I was lucky to find some raw mangoes in our Indian store here in the US.. Combine all of the above in a pressure pan or pressure cooker. Add about 3 cups of water and pressure cook for 3 whistles. Allow the pressure from the cooker to cool. 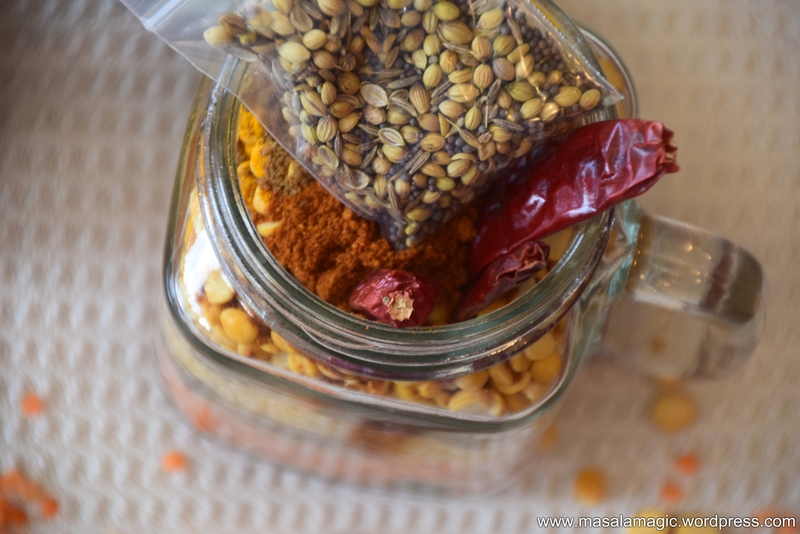 Open the lids, Use a large ladle, masher or a hand blender to slightly mash the dal. If the dal is too thick you may add about 1/2 cup water. Add salt to taste and boil uncovered for 5 minutes. Season with mustard seeds, cumin seeds, urad dal, curry leaves, dry red chillies, some chopped garlic and some hing.You may also add chopped onions for seasoning. However, I never did get to upload my pictures so my big post with exciting stuff has to wait. The first one is – Whole Moong Curry. 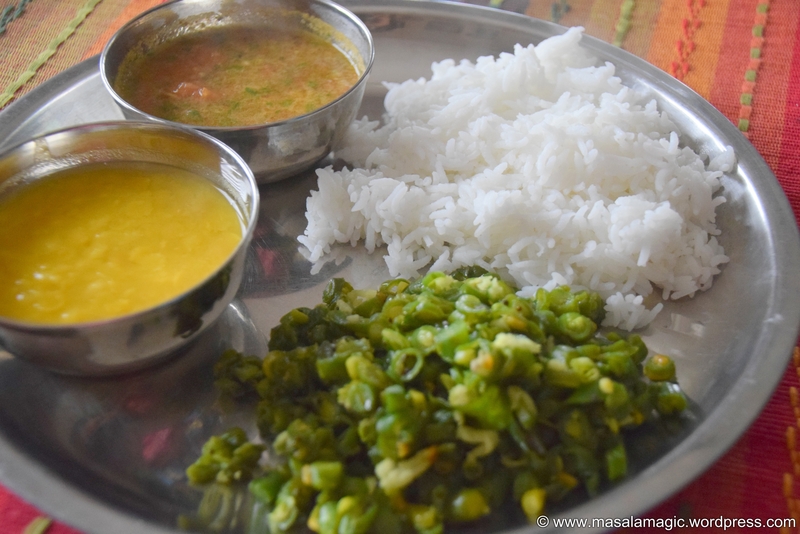 This is a Karnataka style gravy curry recipe and is called “Hesar kaalu Gojju” – Hesar Kaalu the Kannada term for Whole Mung Beans or Whole Moong; Gojju is typically any gravy dish made with a combination of tomato, tamarind and any vegetable or beans/lentils. I learnt how to make this dish from my mother-in-law whose predominant style of cooking is Karanataka Cuisine. 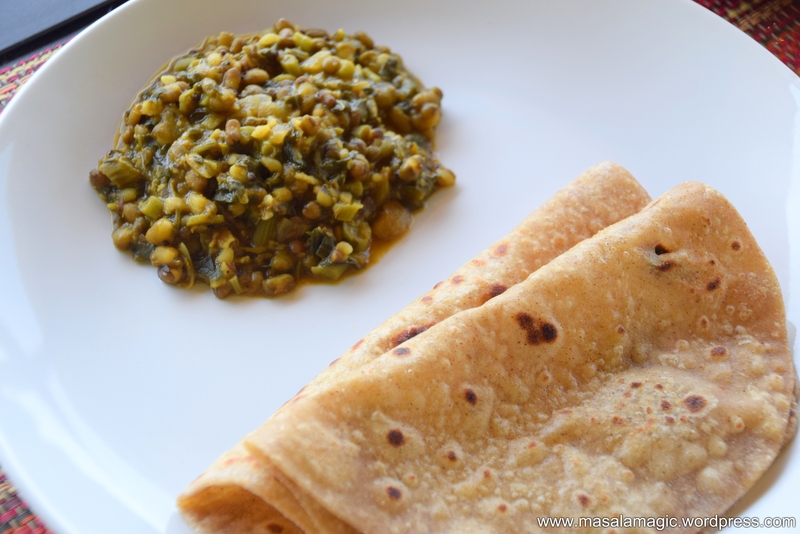 It is regular fare in my home just because I keep running out of ideas for what to serve and also the fact that it is a wholesome dish with the Moong beans providing the much needed protein and that the dish is a perfect compliment to both rice and roti. Combine all of the above raw with 1/2 cup water and grind to a smooth paste. 1. 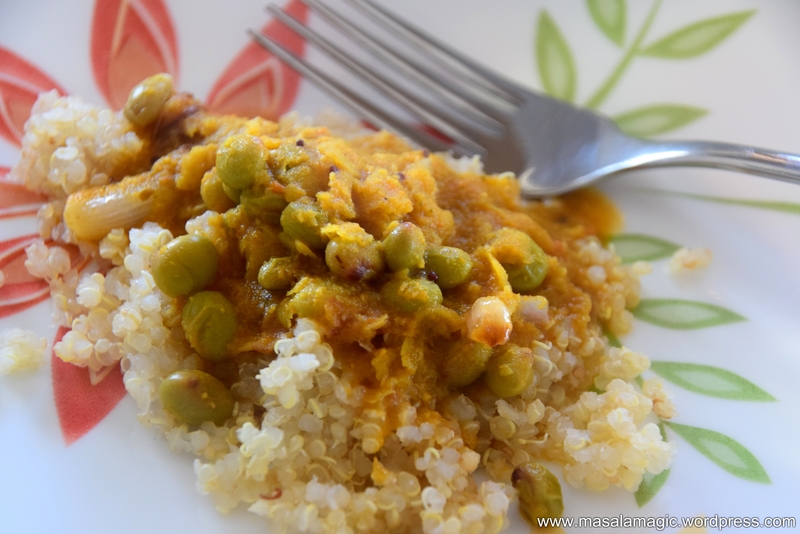 Roast the Moong in a microwave safe bowl for 1 minute. Wash and combine with 3 cups of water and the turmeric powder and pressure cook in a pressure cooker for 3 whistles. 3. Grind everything mentioned above for the paste and keep aside. 4. Combine the cooked Moong and ground paste. Do not discard the water from the cooked beans, use that water also. 5. Add salt and enough water to make it a semi liquid consistency and boil on stove top for 5 minutes. 6. Meanwhile, heat a small pan for seasoning. Add the oil, season with mustard seeds, hing and curry leaves. Allow the mustard to splutter, add the chopped onions and fry until golden brown. Add the seasoning to the above cooked gravy and mix well. 7. Serve hot with Rotis and/or Rice. 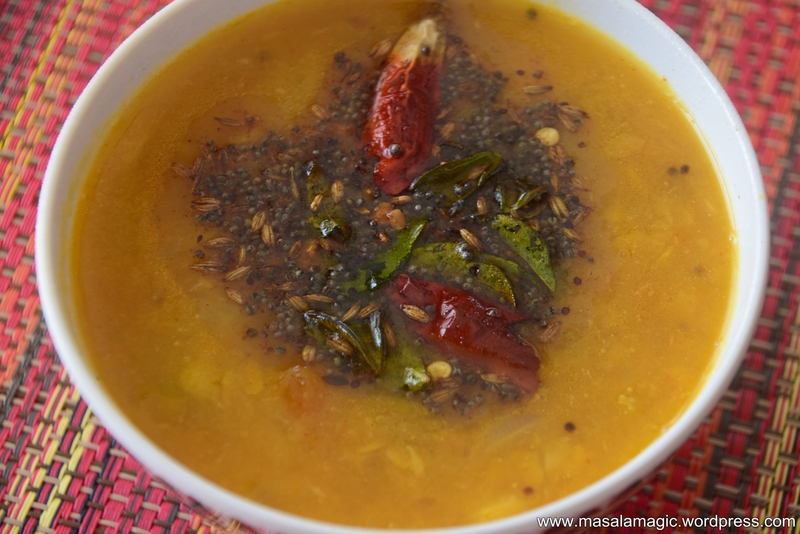 The second recipe for today is – Whole Tuvar Sambar. Again, this is a Karnataka style Sambar or Huli as it is called in Kannada. 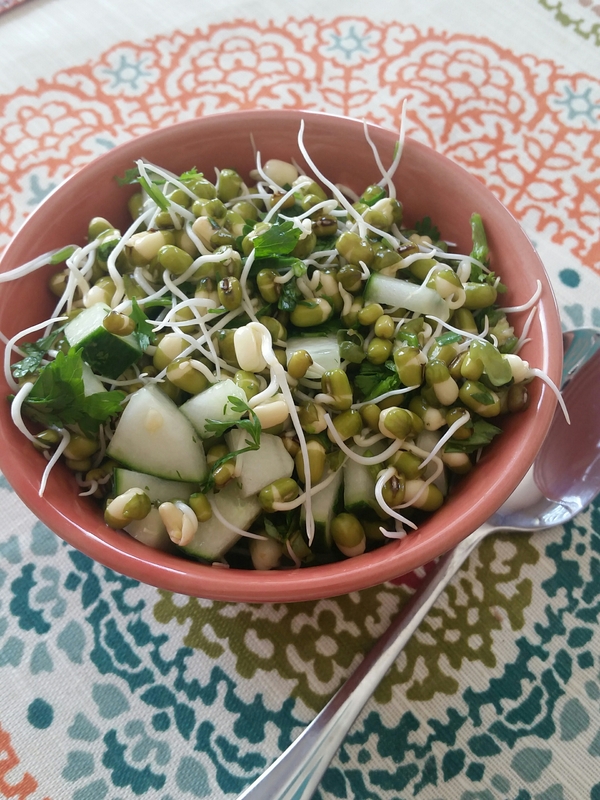 Wholesome, simple and very tasty this is great for when you run out of veggies. 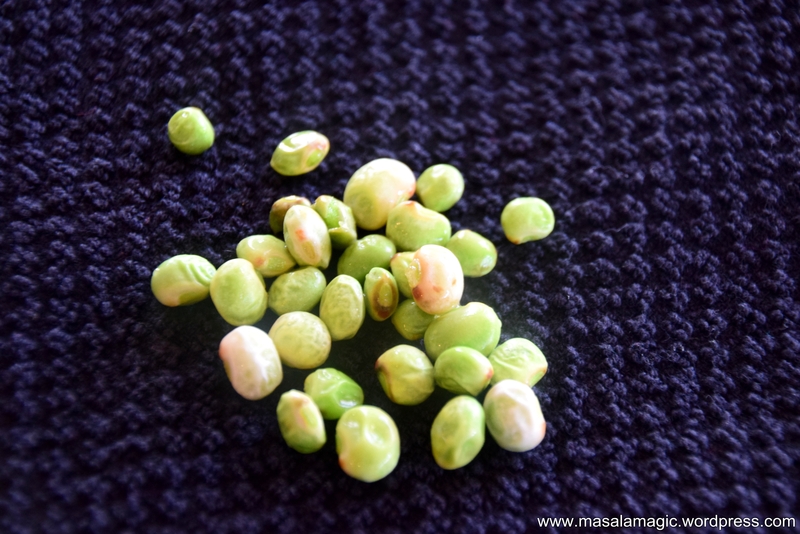 Whole Tuvar or Pigeon Peas as it is called is available in bean pods in India. Here in the US we are not as lucky to get the fresh variety. It is available as “Tuvar Liliva” in the frozen section and is as close as it can get to the fresh variety. Combine the above in a pressure cooker with about 2 to 3 cups of water and pressure cook for 3 whistles. Allow the pressure to cool. 1. In a pan combine the cooked tuvar/dal mixture including the cooked tomatoes and the ground paste. Add salt as needed, sambar powder and allow the mixture to boil for about 5 to 10 minutes. 2. Meanwhile, heat a small pan for seasoning. 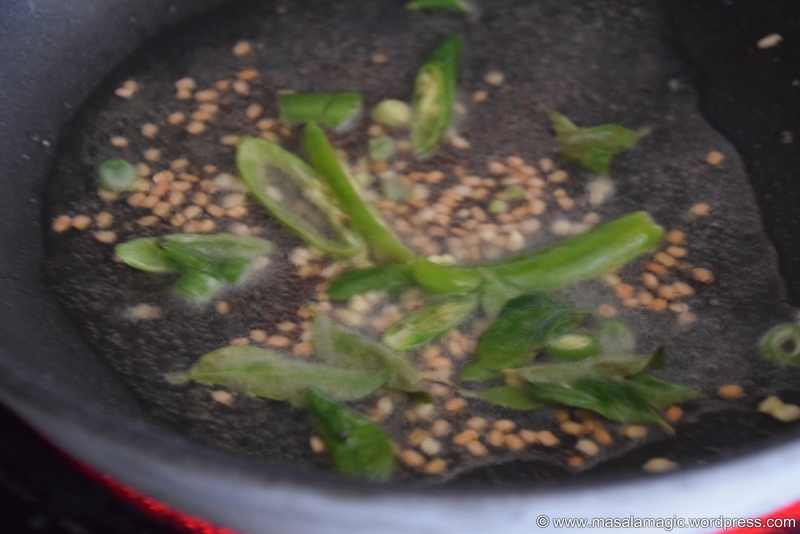 Add the oil, season with mustard seeds, hing and curry leaves. Allow the mustard to splutter, add the chopped onions and fry until golden brown. 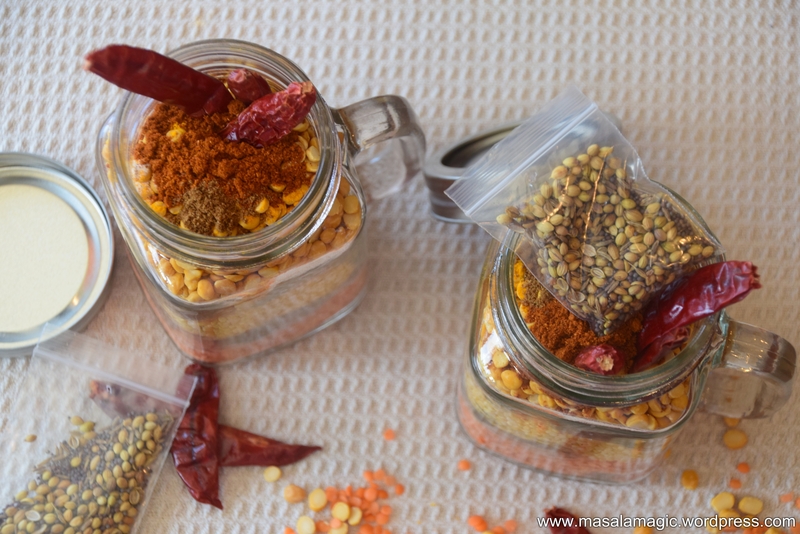 Add the seasoning to the above cooked sambar and mix well. 3. Serve hot with rice. Here below I have served it with cooked Quinoa. 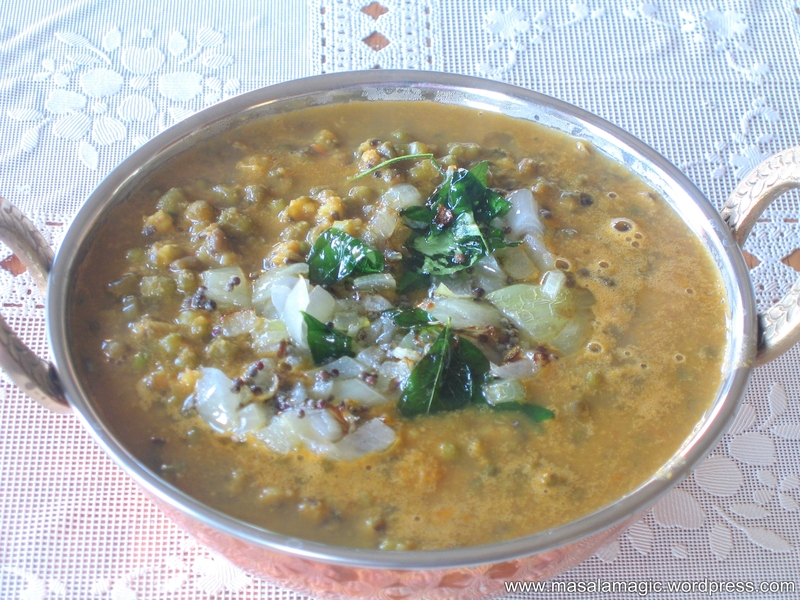 Today’s recipe is another dal recipe. 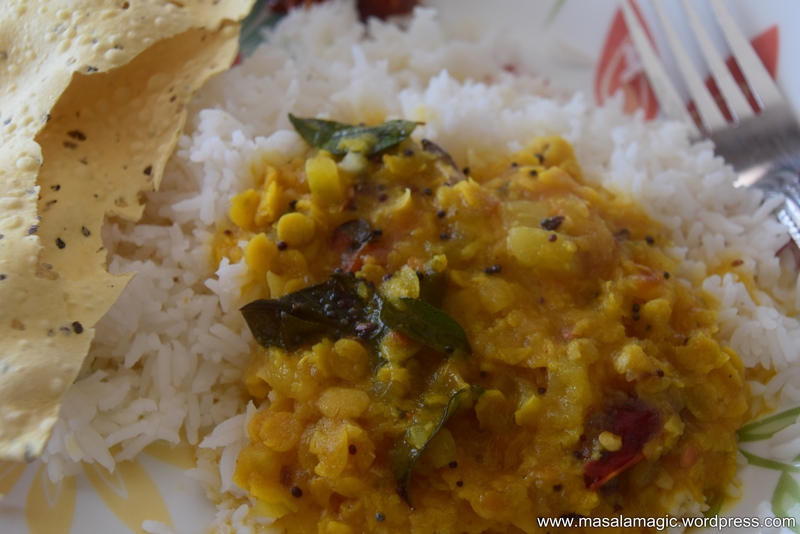 Traditionally in Andhra Pradesh, Karnataka and many other parts of India, a vegetable is combined with a dal to create a Vegetable Dal dish that is typically served with Rice. 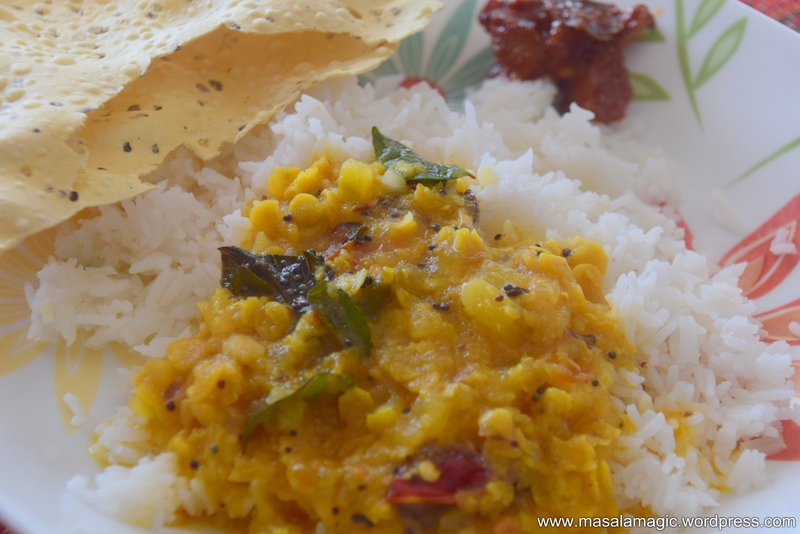 A South Indian meal is not complete without rice and dal. 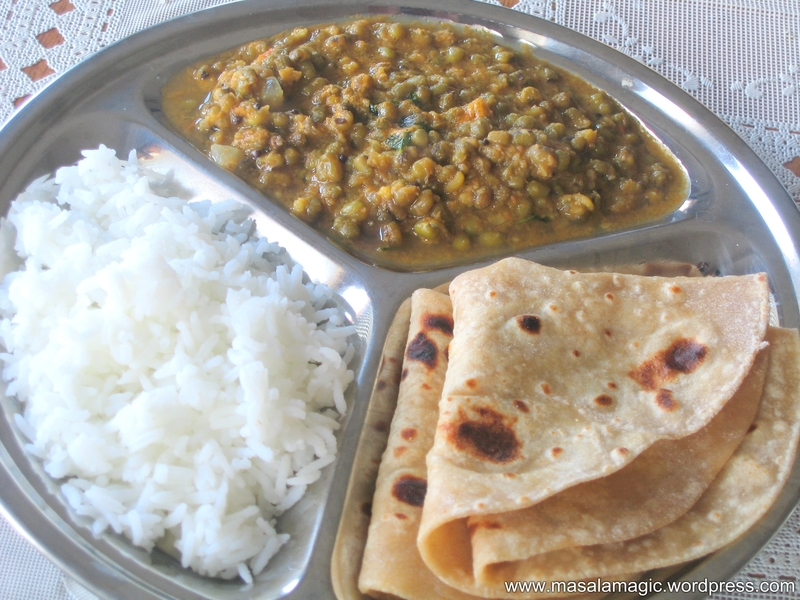 Comfort food that is healthy and nutrtitious with both the combination of vegetable and dal for protein. 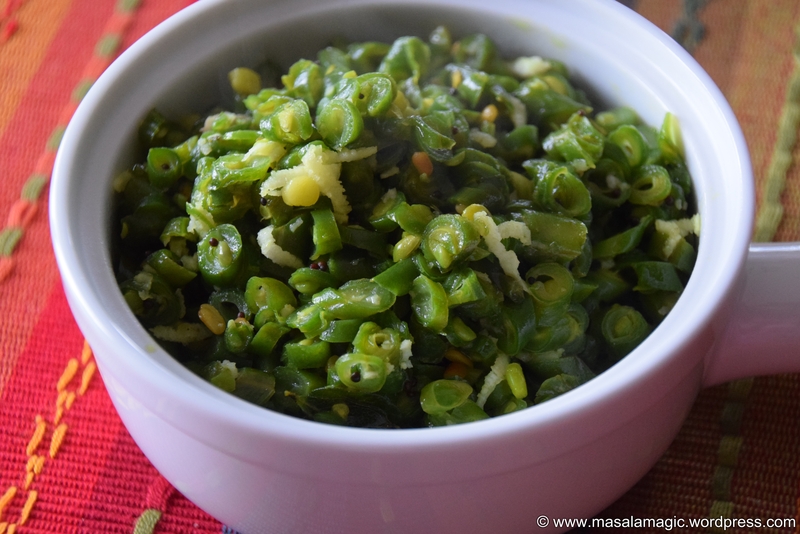 Serve this with papad on the side and you have a simple meal to satisfy your foodie soul. Method: Combine all of the above in a pressure cooker with enough water to cover it. Add 1/2 tsp turmeric powder, 1/2 tsp Sambar powder, 1 small piece tamarind. Close and cook for 3 whistles. Allow to cool and all pressure to dissipate. 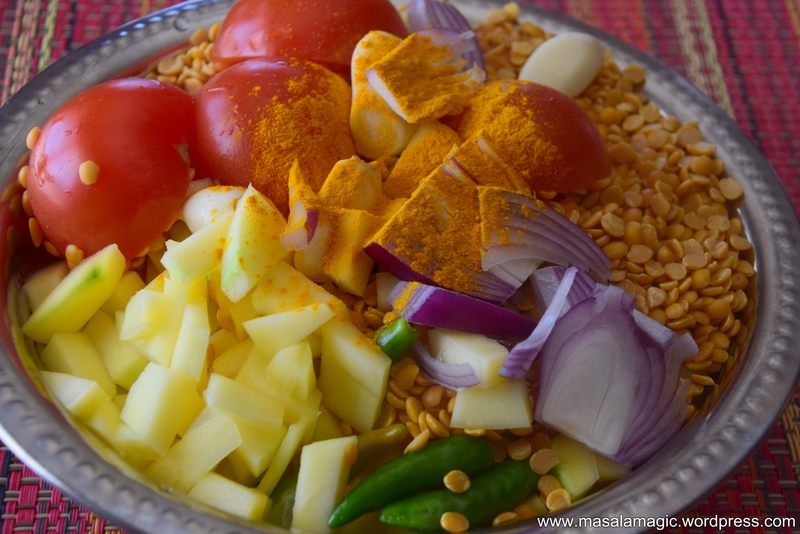 Opne the lid and using a wooden masher or hand blender, coarsely mash the dal mixture. Make sure you dont mash into a paste. Add salt to taste, add about 1 cup of water and boil in an opne pan for 5 minutes. 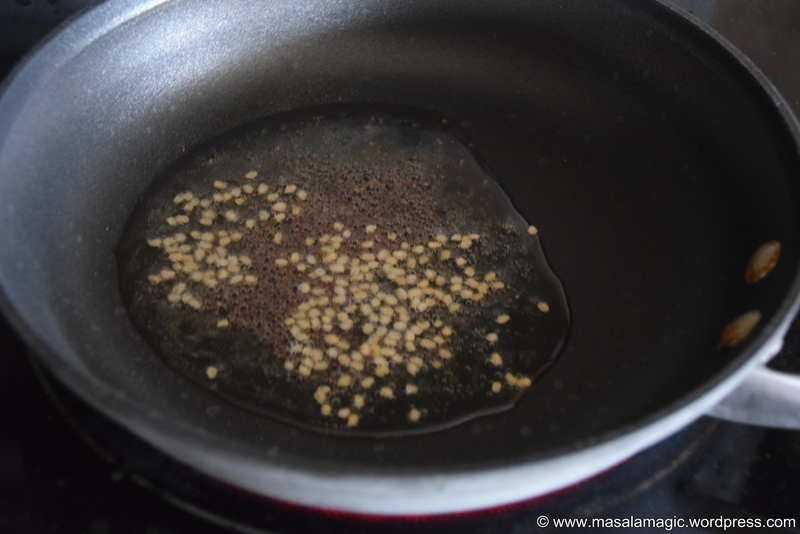 For seasoning: Heat a little oil, add mustard seeds, hing and cumin seeds to splutter. Add curry leaves, onions and saute until golden brown. 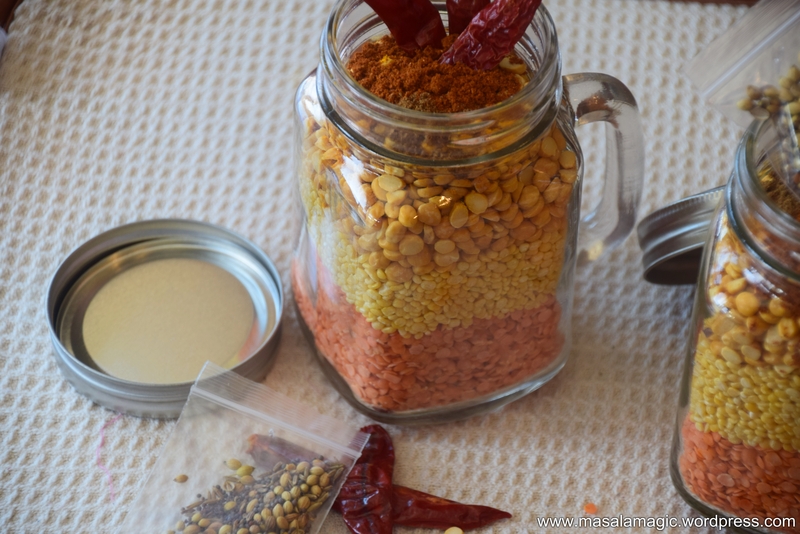 Pour this seasoning over the dal mixture. Garnish with grated (optional) coconut and chopped cilantro. Serve hot with rice. I am experiencing “blogging fever” all over again. I remember having started my first blog on blogspot i think sometime in 2004 (dont exacly remember but something like that 🙂 ) and had managed to write and post over 170 recipes! At that time, somehow it seemed that I had more of a passion for cooking and feeding 🙂 That blog does not exist anymore and all of those 170 odd posts are no more – not saved anywhere..and I think that is the only thing that I truly regret in life so far! Deleting that blog in a very emotional moment.. too bad…I don’t believe i can ever recreate that, but I believe in not dwelling on the past. This simple Tomato Moong Dal dish has been passed down generations…My grandmother made it, my mom makes it and I make it ever so often. It is one of those simple. 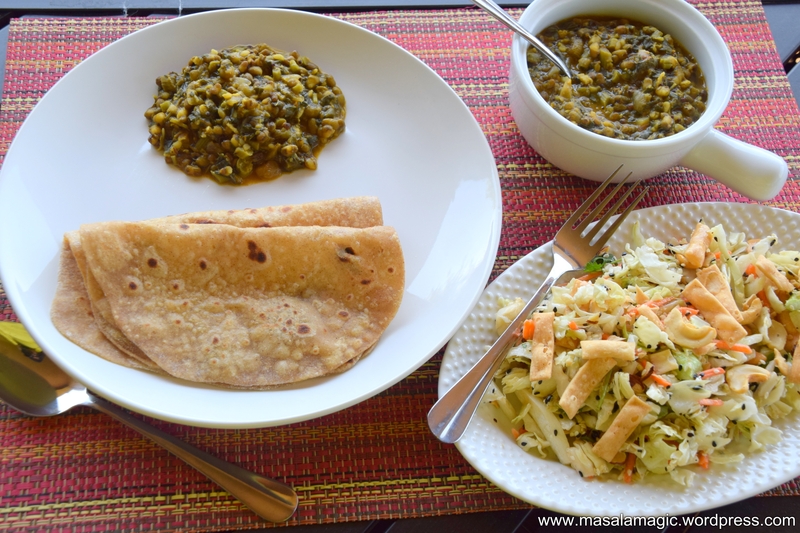 comfort food kind of dishes that no restaurant can create – soemthing you will have to make at home to enjoy 🙂 Easy and goes great with home made chapatis or roti’s.. Enjoy. 1. Boil about 4 to 5 cups of water in a open pan. When the water is boiling add 1 cup of washed moong dal to this boiling water. Cook the moong dal in an open pan. Watch for the grains of dal to split to call it done. The water tends to boil over so use a use or a wooden spatula to keep the water in check. 2. While the dal is cooking halfway, add the chopped tomatoes, green chillies, powdered black pepper and cumin. Add salt and mix well. 3. The consistency of the cooked dal should be semi thick, not runny or not too thick. (I know now that step by step pictures play a huge role, I promise to update this post with step by step pictures soon :-). 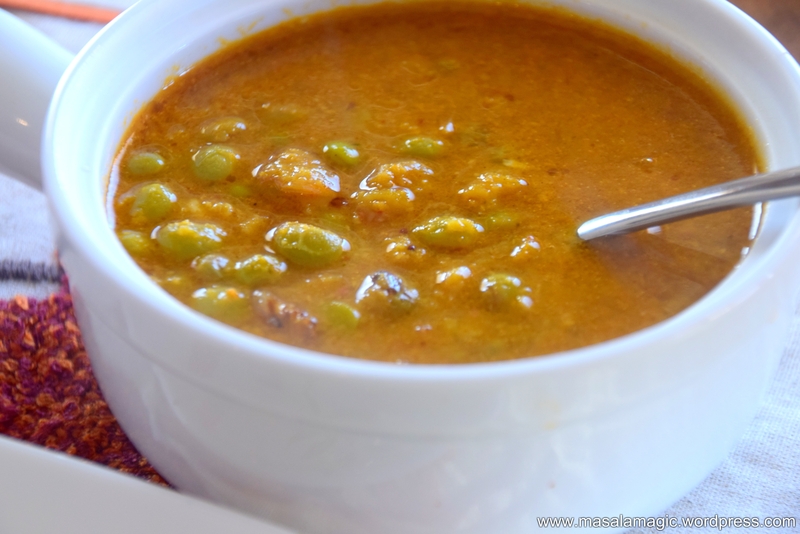 Do not cook the dal in a pressure cooker for this recipe. That will change the taste and texture of this dish. 4. 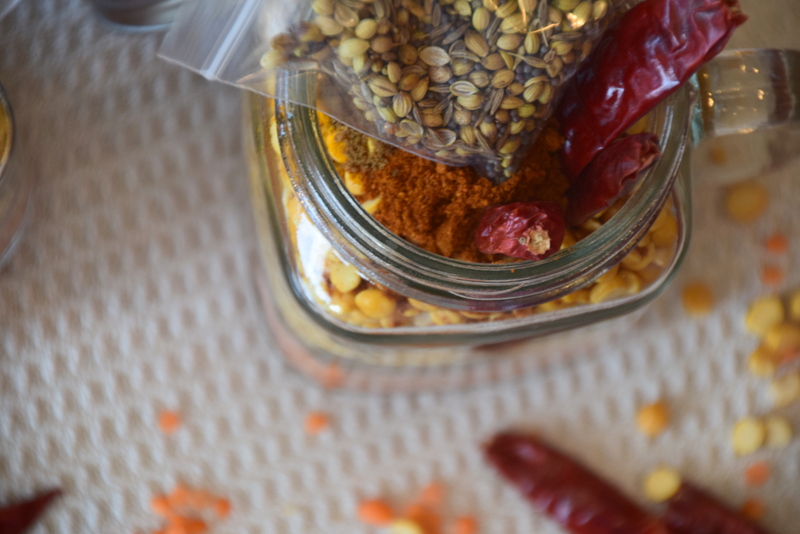 Keep the dal aside and get the seasoning ready. Heat the oil, add the mustard seeds, curry leaves, hing, chopped onions and garlic, saute well and add this seasoning to the dal mixture. Give it one last boil. 5. Garnish with chopped cilantro and serve hot as a side to roti. After 10 days of vacationing and a lot of eating out, its time for comfort food at home. My kids wanted to eat some simple home cooked comfort food (which rarely happens!!) much like how my little 1 year old and 3.5 year old nephews eat. 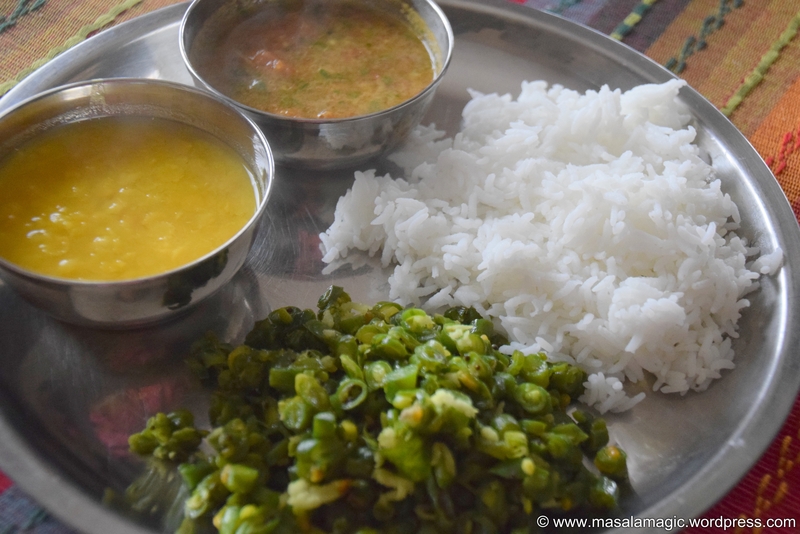 So on the menu today is Rice with plain dal, instant garlic rasam and green beans curry (Beans Poriyal in Tamil, Beans Kobbari Koora in Telugu, Beans Palya in Kannada). Pressure cook the dal with some turmeric, salt and 2 small pods of garlic (optional) in a pressure cooker for 4 or 5 whistles with enough water. After done mash and serve hot with rice. 1. Combine all of the above, except the powder and grind coarsely by adding a little water. 1. In a pan, heat the oil. Add the seasoning ingredients and allow the mustard seeds to splutter. Add the curry leaves and hing. 2. 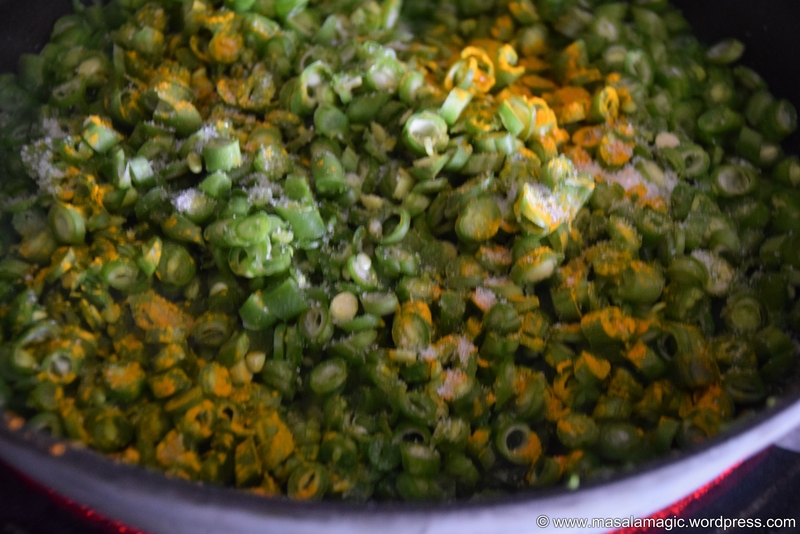 Add the chopped green beans, turmeric powder and salt to taste. Add about 1/2 cup water and mix well.Cover with a lid and cook for 10 minutes or until all the water is evaporated and the curry is dry. 3. Garnish with grated coconut and serve hot. Note: Many of my friends have asked me how my green vegetable (beans, broccoli, asparagus, gavar etc.) remain so green after cooking. I have seen when several people cook green beans it looses its fresh green look and looks a pale dull green which is not veyr apealing to the palate. I cant remember where I read this but many years back, I read that adding some turmeric powder along with green vegeable helps it retain its color. Also ensure that you do not add too much water.